Hands and feet push into the spongey cushion of the mat. The shoulders spread down the back. The diaphragm expands as air is drawn in. A bead of sweat drips from the tip of the nose. For many people this is yoga. Yet those two simple syllables encompass so much more than a collection of bodily contortions. In the western world, people find their way into the practice of yoga for a variety of reasons, often initially as a purely physical experience, but over time discover that other benefits begin to manifest. There are as many definitions, as many opportunities, as many awakenings within yoga as there are people who have sought its limitless capacity to open our eyes and our hearts to the universal wisdom within each of us. 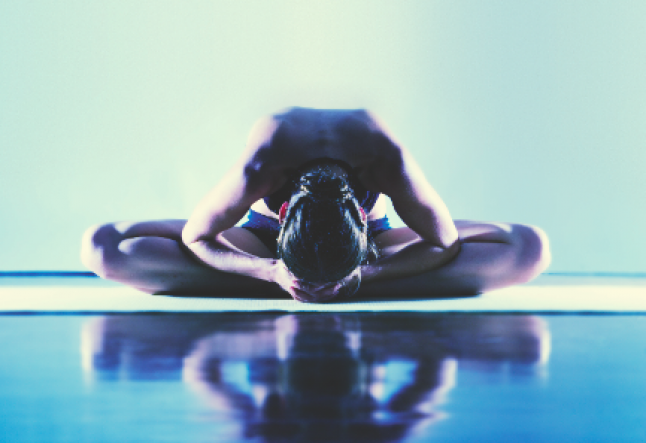 Every person who comes to yoga has arrived by a unique path, a singular set of circumstances and choices that have inspired a desire and search for unity. Recently, that search lead a group of people, men and women from different backgrounds and different parts of the country to the majestic cliffs overlooking the Pacific Ocean. They arrived at Esalen Institute for a week of retreat, exploring yoga’s power, its potential to heal, its path to oneness. They all brought their own luggage, spiritual, emotional and otherwise, sharing the beauty, pain and uniqueness that make each human life an example of the miraculous nature of the universe. Some came to teach, others to learn, all came to share. I joined them to learn about yoga’s place in their hearts and minds. I went to capture their yoga, to catch a glimpse of what they have created. I found, among these pilgrims’ stories of inspiration, growth, commitment, surrender, courage, beauty and perhaps scratched the surface of yoga’s true meaning. Shiva - This yoga teacher, wife and mother makes no separation between her yoga practice and her life. Through many years of committed exploration, she has worked to allow the principles and philosophies of yoga to permeate all aspects of her existence from the mundane to the miraculous. But this hasn’t taken away her humanity. There have still been moments when life’s challenges have pushed her to the limits of her ability to apply what she has learned and deepen her practice. While traveling in India, Shiva and her companions purchased tickets to travel on a train to Darjeeling, a 36-hour trip. Their tickets had been purchased for reserved seats. The rather startling realization that train service in India is quite different from that in the States tested Shiva’s practice of detachment as they boarded the train and found that there were already five people sitting in their berth. The aisles were jammed full of people, all shuffling for space. Passengers were everywhere, even using the bathrooms as seats. For those 36 hours there was nowhere to go. For Shiva, this became a microcosm of the pressurized state of our modern world. Even though we work with deep earnestness to open our hearts there is still often pressure to remain closed down. During the trip, she went to a place deep inside herself connecting to Bindu, the small focused place in the center of our being, which is all that she felt that she had of herself. By connecting to her Bindu, breathing and finding the laughter of the moment, Shiva was able to acknowledge and accept her humanity and the humanity of the situation. Jeffrey - Jeffrey is a 44 year old realtor from San Francisco with three children who has been practicing yoga on and off for the last twelve years. However, Jeffrey has committed to make this year his “year of yoga” by maintaining a daily practice and deepening his knowledge and experience of yoga with workshops and retreats. While going through a divorce, Jeffrey went to a yoga class that turned out to be a life altering experience for him. The class gave him a nurturing space to take care of himself and to discover that doing something beneficial for the body did not have to mean beating himself up. This yogic space created for him a sense of community that he had never experienced before in his life. The strong sense of connection he found to the community that surrounds yoga enabled him to expand that connection into the rest of his relationships. It is a subtle shift that over time has given him more internal strength to travel through minor difficulties. And an important fringe benefit has been yoga’s help in allowing him to maintain the energy to keep up with his kids. Natalia - A yoga practitioner for nine years, Natalia is a 39-year-old native of New Jersey who currently lives in the Bay area. She comes from an academic background with a master’s degree in economics and had a career as “one of those people who analyzes and fixes things.” She describes her experience as being part of a very left-brained world where there were always projects to do but no awareness of the results of any of her work. Natalia originally turned to yoga as a way to take care of her body as an adjunct to her marathon running and then found herself moving deeper and deeper into the path of yoga. She began to notice things and became more reflective about her life and her feelings. Next came the development of a practice of gratitude. Rather than berating herself about what she couldn’t do and wallowing in feelings of incompetence, she now finds that she has the ability to laugh at herself and be more self-loving and compassionate. Andrew - For 15 years Andrew has been practicing yoga, although he sees the last three years as his true commitment to the practice. Since attending graduate school at Yale, this 45 year old has run a non-profit called Global Routes which works with high school and college students doing community service and adventure travel in Africa, Asia, and Latin America. Yoga started for Andrew, primarily as a physical pursuit but gradually grew into a spiritual, psychological and emotional journey. Before yoga, Andrew felt an internal sense of lack, of inadequacy, a feeling that there was never enough. He found that because that core place was weak and vulnerable it was challenging to show up for life and he often found himself living in a defended place creating friction and challenges with the people around him. Gradually that core space became more open and Andrew’s relationships became easier to manage. His belief centered on the intention to start the day with what’s real, with what’s happening right now making him available to fall into the unknown and available to face fear. Trista - A single mom living in Fairbanks, Alaska, Trista owns a massage therapy business and has been practicing yoga for eight years. She finds that the greatest benefit she has received from her yoga practice has been a sense of focus that allows her to live and manage her life more successfully. Each day is filled with the basic life chores of getting lunch ready for the kids, cleaning their clothes, knowing when her first client is scheduled, and having dinner ready at the end of the day. For Trista, yoga is a place where “I feel I can manage all of that, so that I can go into my heart. Even when I can’t practice every day like I want to, yoga gives me something to look forward to, something to focus on.” Yoga helps Trista remember to love, to judge less, to watch herself perform those daily tasks and notice the love that is part of the exchange that she experiences with her children and the world. Desiree - A senior level certified Anusara yoga teacher, 46-year-old Desiree has been studying yoga for 18 years. She found yoga while attending an aerobics convention where she was attracted to the only yoga workshop being offered. She then searched for more yoga, studying Iyengar and finally finding a home with Anusara. Since that time, her practice has sustained her through times of bliss and times of tragedy. It has been both her companion and teacher, opening her up to the strength and stillness that resides within her. 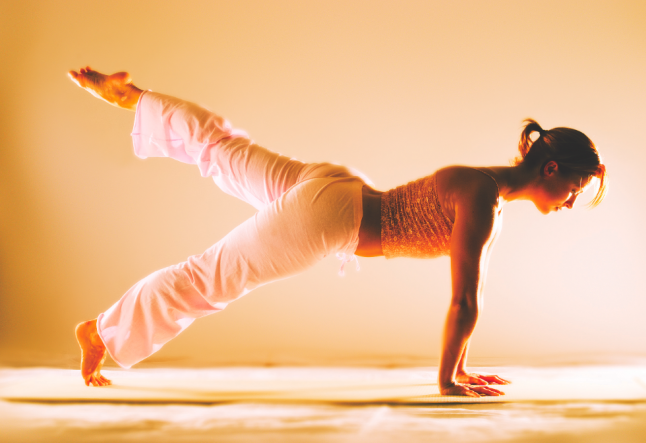 As her yoga practice deepened Desiree found that the strength of her core allowed her to open her heart more freely. She used to search for external forms of power, trying to control other people, molding them into who she wanted them to be. Through her journey with yoga, she now finds that she is more and more able to embrace others for who they are and to be more present with and accepting of herself. Many diverse and twisting roads converged, bringing these souls together to commune in a place of beauty and openness. For each of them, yoga is a collection of poses, but it is also a teacher, a nurturer and a haven. It did not give these people anything that did not already exist inside of them. It provided guidance to unlock the boundless well of potential within them, filling a unique and singular need. Each of them shed a piece of shadow and stepped out into the light of living fully, joyously and openly and I am better for having been a witness.